Mariet will graduate Uhuru Academy in 2018. She recently lost her legal guardian and is seeking a permanent home. Mariet dreams of becoming a designer and/or journalist. Lilian Muli Kanene’s Hip-Hop design work inspires her to make her own unique line of clothes. Mariet is a self-proclaimed “Selfie Queen” who would eat strawberry yogurt for every meal if she could. She enjoys attending Uhuru Academy because it gives her the freedom to choose from many co-curricular activities. 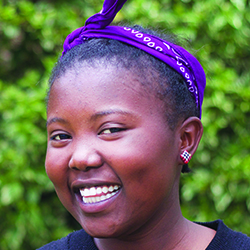 Mariet is currently in Zumba classes and journalism club at Uhuru. Click here to sponsor a student like Mariet.